My Mom, she is in her 20's and hunting with my Father. She could have been a pin up girl! Beautiful! If you look closely, you will see the deer walking behind her. I am not sure if this is real, or my Father was ahead of his time with photo shop!! (my Father took photography classes and was very creative and ahead of his time, I am suspect, but either way, he was clever and had a sense of humor) However, I am told it is real! "Mom...look behind you!" Your mother is the person who created you and most likely raised you. 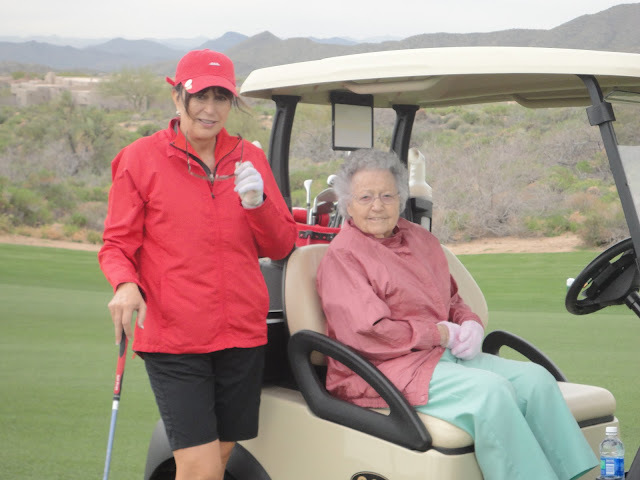 She has served as a teacher, a mentor, a nurse, a driver and a friend, she was the one there for you, while you were growing up and did not walk away, no matter how frustrated she could be. You shared all the emotions; happiness, tears, anger, sadness and joy. A mother's love is unmatchable, writing her a poem expresses gratitude and shows her that you know how much she cares, and that you care, too. 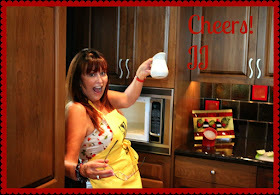 More than anyone else, mothers appreciate homemade gifts, because they understand the thought behind creative presents. Before you write anything, think about the relationship you have with your mother. Most likely, you have years of material and memories. Recall your favorite times, and try to choose three different memories from different periods in your life. For example, one memory from your young childhood, one from adolescence and one recent memory. Pick up your pen and begin writing on the stationary. You should have three stanzas (like paragraphs), one for each memory. Each stanza should have about four lines, but this is flexible. You also do not need to make each line a complete sentence. You don't have to rhyme the lines, but if you choose to, use the thesaurus to look up words you need to rhyme. When you have finished writing the poem, write the date in the top right corner. Your mother will probably want to keep the poem for a long time, and she will want to remember when it was written. Place the finished poem on the kitchen table, maybe next to flowers, or somewhere you are certain your mother will see it. We are all set for Mothers day! We have made a beautiful footed cake plate (last Wednesday's blog) and now let's serve Mom some tea and Madeleine's! Preheat oven to 375 F. Butter and flour a Madeleine pan. Using a mixer, beat the eggs and 2/3 cup sugar in a large bowl just to blend. Beat in vanilla, lemon peel and salt. Add flour; beat just until blended. Gradually add cooled melted butter in a steady stream, beating just until blended. Spoon 1 T. batter into each indentation in the pan. Bake until puffed and brown, about 16 minutes. Cool 5 minutes. Gently remove from pan. Repeat process, buttering and flouring pan before each batch. These can be made a day ahead, but, are best day of. Dust cookies with powder sugar. Our daughter Laura and son in law, Ross sent us this for Easter. The foot is our grand daughter, Julia's, little 5 month old foot. This is a cute idea for Mom or Grandma!! We framed our little Julia's first art work and are hanging in a collage eventually, when we get other little works of art. For now it sits where we see it, and are reminded of her, every time we go into our bedroom. So thoughtful and heart warming for grandparents. 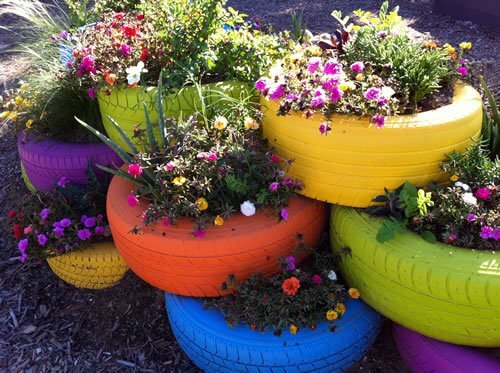 Old tires re purposed into a colorful floral display!! My Mom would love this!! Actually, if I could figure out where to put this, I would love to make one, with my kids!! I would put herbs and flowers in it!! LOVE THIS!! 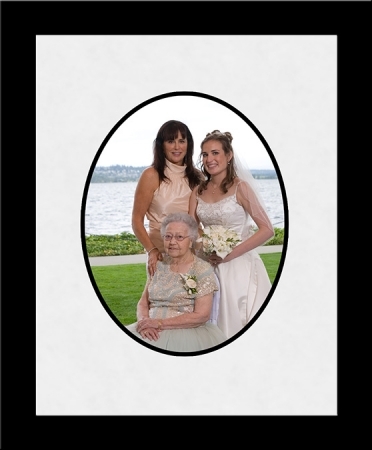 Another idea for Mom: Three generation photo, I had made for my Mom, when my daughter married. Photography by Dave Harmon. If you are in need of a family portrait, wedding, pet or children/baby photo's, he is amazing. Click on the picture on the right ,of Wee Bear, me and our pups and it will take you to his website. Update: Our Mommy in our flower pot. Her little chick is too big to fit under her now. I think they will fly away soon. She has grown to trust me, and allows me to come right up to the pot. Have a wonderful weekend and Mother's Day! I hope I inspired your creative side this week! See you on Healthy Monday! 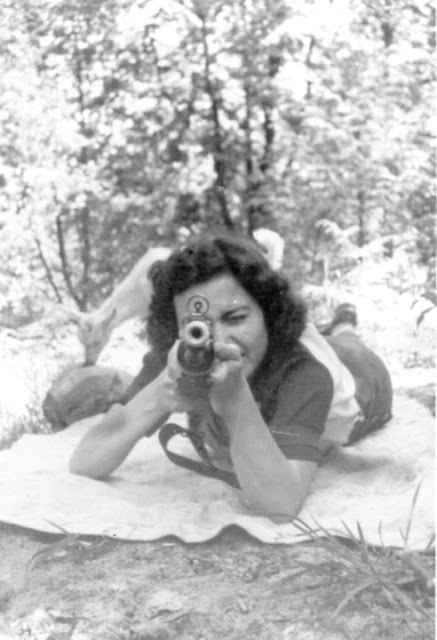 I've always loved that photo of Grandma! Sweet idea about the poem. I am so thrilled you love the Easter card from Julia. Happy Mother's Day! Great blog entry! Yeah, it's a great photo! Love our card from Julia, so clever! Thank you, you are a doll, just like Julia!